The simulation of the entry, descent, and landing (EDL) phase of Mars landing missions draws aerodynamic information from a data base for each configuration from hypersonic entry to touchdown. 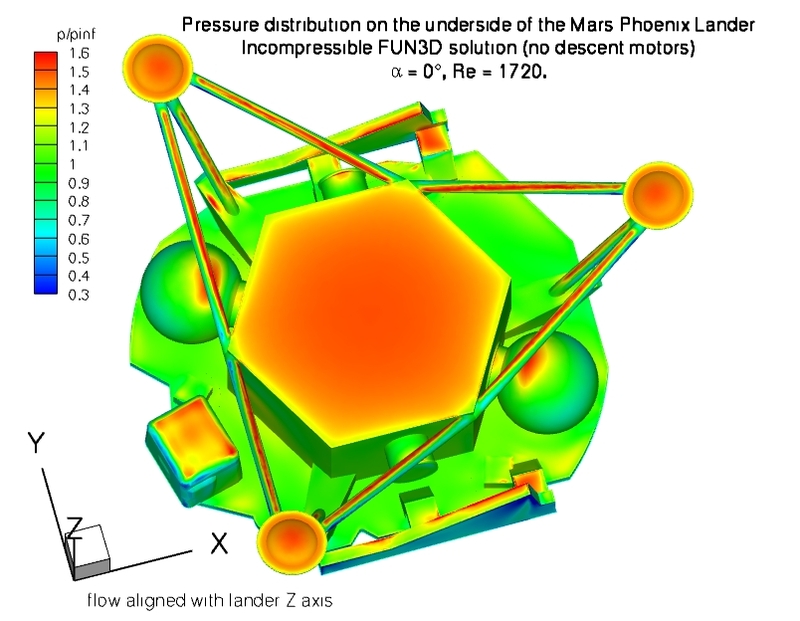 Aerodynamic characteristics of the Mars Phoenix mission lander during terminal descent were obtained from scaled-model tests in a small research wind tunnel. The wind tunnel model was fabricated using a machine that processed the CAD surface definition to deposit layers of polycarbonate. Since a CAD model was available, the GridEx software package was used to create a surface grid from the CAD model and the AFLR3 software package was used to create the volume grid. This volume grid was used in the FUN3D suite of codes to compute flow solutions using the incompressible equations at angles of attack from -10 to +40 degrees. A sample of the surface pressure distribution is shown. 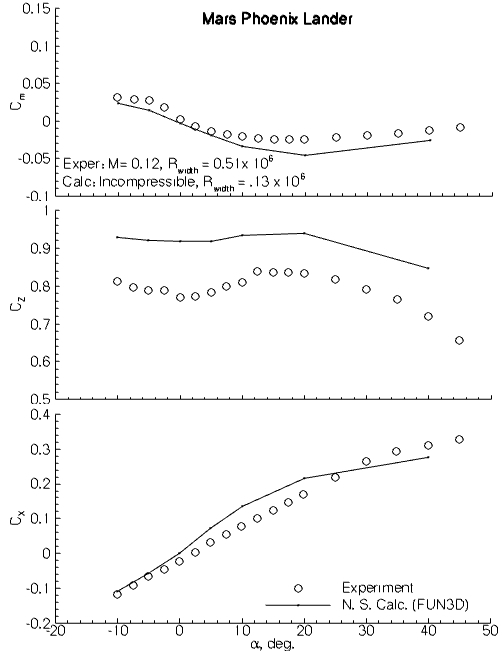 Initial comparison of the computed integrated forces and moments with the wind tunnel results indicates good agreement except that the axial force (Cz) was overpredicted. Additional analysis is needed to see if the cause is related to a difference between the computed and measured pressures on the lee side of the lander.